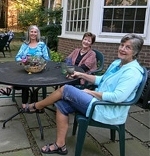 In 2004, Karen Bush, Louise Machinist, and Jean McQuillin bought a house together and began a shared community adventure. The authors’ professional backgrounds in psychology, healthcare, education and consulting, coupled with imagination and determination, emboldened them to create an economical yet enhanced lifestyle model. Their book, My House Our House: Living Far Better for Far Less in a Cooperative Household (St. Lynn’s Press 2013) invites readers to step through the door and learn what makes a cooperative household work, including their General Partnership Agreement and ways to set healthy boundaries. Find additional resources about shared housing models on the MHOH website, and My House Our House on Facebook. We all get a huge energy charge out of being independent together, taking care of business in smart ways, learning and doing. Mundane tasks feel more like adventures. At first daunted, we’ve grown to enjoy changing the old-fashioned gaslight mantles. Louise is usually the one balancing precariously on the stepladder, but she can do it because Jean and Karen are always there, supporting the ladder. Together, there is a zest for tackling new things; for stretching. Life is good in big ways and small in our co-household. Here’s a small nitty gritty example: cohouseholding means never having to scoop the litter box (for Karen and Louise, at least). Imagine: A balmy summer night at Shadowlawn, Louise on the porch, feet up, drink at hand, deep into a novel. Karen cooking dinner. Jean scooping out Kali’s litter box in the basement. What’s wrong with this picture? Nothing’s wrong; everything’s right. Louise will clean up the kitchen—again. And put out the trash for collection. And already did the daily Tweeting. We used to share the scooping, taking turns on a whoever-thinks-of-it-first basis. Imagine Louise and Karen’s relief when Jean decided to take it over. Every week! And also to keep a steady supply of toilet paper on the basement storage shelves. So Jean “owns” a specialty job category in our shared home: toileting hygiene. She has a system, a schedule, and the tasks always get done. we share most tasks without assigning them. We’ve found that we don’t need “rules,” because everyone carries a fair share of the load, balanced out over time. Among us, we have the skills, determination or stupidity to tackle just about anything. Nobody nags—but we might occasionally remind. Keys to success with chores: 1. Own responsibility, 2. Always do what you say you are going to do. Motto: I will do my fair share better than anyone else can do my fair share. Before sharing a living situation with anyone, be sure that you and they have similar lifestyle expectations. How neat? How clean? Who will do what? It’s the little things that count, day-to-day. Consider: could an always-overflowing litter box sink your cooperative household? Co-householding allows us to conserve environmental resources. Needless to say, we now use 1/3 the number of household appliances and many other material items. We have reduced our environmental impact and reaped huge utility savings. In 2003, Louise’s utility bills totaled $3,113. with no air conditioning and no cable. Jean’s were similar. At her tiny white house, Karen’s utilities totaled $2800. So, roughly $9000 for our 3 separate residences. Bottom line: Our 2005 utilities totaled $5,332. for a big old 4-story air-conditioned house, savings of almost 50%. Play mental arithmetic for a minute. Think about your own situation. Consider what you pay for rent. If you were part of a cooperative household, you could divide that by 2, 3, or 4. How much would that enhance your lifestyle? Meditate on your taxes, utility costs, household services, hours of home maintenance. How could you use that extra money? Those hours? And now, we finally come to that retirement question. And, yes, we are finally planning to retire in the next one to two years. So: do we choose snow or sun? Pennsylvania or Florida? But we don’t have to choose. Enhanced financial freedom allows us to say BOTH. So here’s the plan: Shadowlawn North and Shadowlawn South. We’ll be snowbirds and summer birds, living far better for far less in two cooperative households, Pittsburgh and Sarasota. A great writeup! This kind of living arrangement should become more popular in N. America. In other parts of the world, such as Asia and Africa, multi-family households are very common. Combining the resources of many individuals is an extremely effective way to ensure financial stability while also lowering individual living costs. The added social aspects are a bonus.